Thank you! I just checked out the link you provided and to be honest, this is the first I have heard about these bags. It doesn’t look like the leather is treated differently, but rather the bags look like vintage bags that have been used (or artificially aged) to create patina. If you look at the twill, it also looks faded and roughed up a bit. As far as I know, all new Filson bags are made in the USA (at the Seattle factory). Thanks for sharing the link and thanks for following the blog. Hey, thanks. If you see on the bottom of the page there’s the words: “Made in USA, lavaggi e finissaggio pelle in Italia” which, google translator translates as : “Made in USA, washing and finishing leather in Italy” To me it seems like they sort of break them in or something. Either way, they look pretty cool I think. I’d love to have a broken in, aged bag. Anyway, keep up the good work. I was looking at that site again and I noticed that too! Needless to say, I am quite intrigued. Based on that translation, it sounds like the company is adding artificial patina to brand new Filson bags and then selling them. From the pictures, I think they look absolutely amazing. I am very curious about the process that they use to achieve this look. I will attempt to contact them and report back with my findings. Again, thanks for sharing the link. Thank so much for linking us through – I just found the page today! 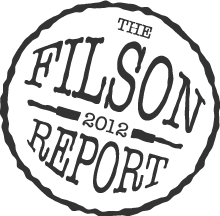 How excited are you for the new FW13 Filson gear? Rugged Twill BLACK and NAVY!!! So excited. I’ve had a few sneak peeks at the Filson SS14 collection too and it is truly amazing – this brand is doing some fun things in the future! Keep in touch, we’ve just got some new gear in this week and we’ll be profiling it on our blog in time for Father’s Day! If you’re ever in Victoria, come by for a visit. Keep up the great work on your site…I truly enjoy it.